Oh it's going to be such a good day when we get back in power. I look forward to sense and civility being brought back into government along with the immediate removal of all Labour's far left, Marxist and Socialist vandalism of the country and it's institutions. So we are now celebrating the election of the most left wing President ever to be elected in the USA. Barack Obama (who is no more “black” than “white”) seems to me to be a Tony Blair type of person; good at talking but never actually done anything in his life so far. Rather like David Cameron too! I fear that Obama mania will all end in tears. As for Boris, I have lost all enthusiasm for him since he advocated an amnesty for illegal immigrants and, more recently, was claiming “expenses” for visiting the Tory Party conference. I couldn't agree with Boris more! There is indeed something of Tony Blair in Obama, cerainly with his ability to make grandeliquent speeches. I really hope I'm wrong about that and he will turn out to be an honourable man. The hype though is enormous and I expect that many people will be disappointed after he's been in power a while. I hope he's a friend to Britain, for me that's the most important thing. Well done Boris. Whatever your views, you can't deny the historical nature of today. - in favour of increasing government spending? The truth is that Obama could easily fit into the Tory party. Yes, he's left-wing by US standards, but the Tory party, by those standards is something akin to the "Gay Eco-Feminists for Ralph Nader" Party. It looks like bandwagon jumping to me. So Obama the socialist is a "great man"? As much as I am a fan of Obama, we are NOT Americans and this flag has no place above any city hall. It makes me laugh how Tories rant on against any symbols of Europe, but they're always to first to hoist up the Stars and Stripes as though we're the 51st state. We ARE Europeans. We are NOT Americans. I can't wait until Dave becomes PM. It may stop me leaving Britain. "BORIS FOR PRESIDENT" (only after 8 years in London)then we could get both countries back on track. shut up NorthernMonkey, you're a tiresome meme for a typical UK socialist funktard. Thats how I recall the campaign (at least that what the BBC endlessly ramed down our throats) - however the BBC list of 'celebratory events' suggests the public view is a bit different http://news.bbc.co.uk/1/hi/uk/7837279.stm. His colour/ancestory doesn't matter to me, but the dishonesty that is political correctness does (I'm not suggesting you are dishonest, just that the coverage is). Obama, Obama, Obama, I am bloody sick of hearing about Obama, every time I turn on the radio all I hear is the BBC engaged in Obama worship. So Obama hasn't even got to power and I already hate him, not for anything he is or has done, or is possibly likely to do, I hate him because the BBC sees fit to ram their hero worship of him down my throat! Malcolm, I also worry that Obama is similar to Blair, more a narrator than a directional politician. But he differs from Blair in one important respect. Obama has no Gordon Brown shackled to him. Please do not use others' names even if the impersonation is obvious. It seems as if Boris is setting a fine example, for the rest of the nation to follow! Why is it, that so many people in our country have an "issue", with a picture of the Queen? Our flag should also be displayed more routinely, throughout the country. "NorthernMonkey's" reaction to this post, is both predictable and lamentable. Its not as if he even likes from what I've seen. Quick question - has anyone every explained coherently (to a 'normal' person) why in Britain there is this distain for the flag and nationalism..
- because we never had a revolution that stuck? - self loathing for the empire? - class war and the identification of patriotism with establishment? ps, Tim/Jonathn - the about the Conservative Blogs on the right pane - "ConservativeHomo" no longer exists. I'm not g*y btw, just a little curious. Oberon, some people like to associate nationalism with facism. Also, there is a tendency to regard true patriots as "Little Englanders". I believe that all of your reasons for the "distain for the flag and nationalism", are quite correct. As I suggested earlier, displaying our national flag should be far more commonplace. This should not be something of ridicule, despite the views of those on the left. I also support the decision of Boris, to display the American flag today. 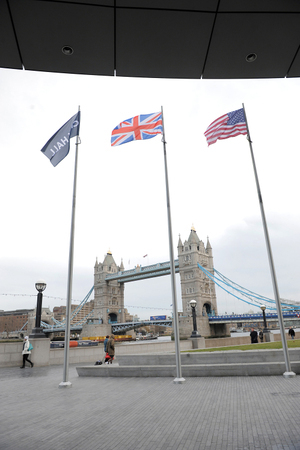 That said, I agree that Boris should have put the flag up as a sign of solidarity with the US in general and shouldn't be put off by it being classed as Obamamania, even if he is going to ruin america. A little worrying is the last sentence... "But the inauguration of Barack Obama, as the 44th President, is a cause for a very special celebration." It is a cause for a special celebration because a nation as moved on from judging people by there background and race to judging them on the content of there character. Here it couldn`t happen. We have a system that bars Roman Catholics from becoming head of state and seems to make it hard for those from minorities to progress. Its a disgrace that neither the Cabinet or the Shadow Cabinet have a member of any ethnic minority in them. I pray for the day we have a member of an ethnic minority or a muslim as our leader as it would show that we have moved on and really become a modern country. "Its a disgrace that neither the Cabinet or the Shadow Cabinet have a member of any ethnic minority in them." So Ed and David Miliband aren't minorities? "I pray for the day we have a member of an ethnic minority or a muslim as our leader as it would show that we have moved on and really become a modern country." We have. He was called Benjamin Disraeli. You sound so uneducated, I doubt you will have heard of him. He used to be our Prime Minister. AIJM. You know as well as I do that Jews have been intergrated into this country for generations and I am talking about the new generation of immigrants. Also the comments of Obama being a Socialist is nonsense. In European terms he is a Social democrat. Jews have been integrated. As are all minorities. Are you actually claiming that there are active policies of segregation in the UK? That sounds like tribal tokenism and that is hardly modern, the true modern country would be where we elect people for their values not their skin colour. Of course the left would also have to square the circle of their multicultural ideology, which states that only black people can 'represent' black people etc, thus if we have an ethnic minority as leader he would be able to represen the majority white population. thus if we have an ethnic minority as leader he wouldn't be able to represent the majority white population. What are you on about Julian Hawkesworth? I never said our flag shouldn't be flown above our public buildings, I said America's flag shouldn't. We're not an American state so we shouldn't be flying a foreign flag from City Hall. And YMT I suspect I've contributed far more to this blog than you ever have. If you want to throw tiresome insults, go to Guido Fawkes. Elaina Brier has hit the Nail on its head. Why on earth are we celebrating the election of this pinko ninny he is a gifted speaker that’s for certain, he has taken so many people in with his shallow jive talk. Can you tell me what he stands for? His policies are those of a socialist. He is clearly not a Conservative as we would understand that word to mean. He is a professional politician, not a conviction politician. Notice how all of the professionals are queuing up to touch his garment. He has done a great job of getting himself elected on a wave of “any change is better than this”. However he will be a liberal and into BIG GOVERNMENT. Do we really want our nice Dave to rub up to close to the man, his socialism might just be catching. The Key phrase of Obama’s first term in office will be Quantitative easing. I know a few of you are already linking Obama to an anti-Christ like figure but Bush was a real devil. Thank G*d that he is history. How will Obama’s presidency turn out? I have no idea, but I do feel good about him for now. thus if we have an ethnic minority as leader he wouldn't be able to represent the majority white population." If Labour are still in power in five years, you will not be allowed to say that. That my friend is a politically incorrect view. They would argue that only merit not his ethnic background should determine if a person is leader or not. If one lays off the politics for a moment or two (I know it's hard) it's possible to conclude that Boris was merely paying the new president a compliment. And a very generous one at that. No harm in that. Very decent. Good on him. And good luck to President Obama. He's going to need a lot of it. "That my friend is a politically incorrect view"
Sorry of course it is, I'll book myself into a racial awareness and cultural sensitivity re education course this very minute. I must remember that its only white people who are racist, which makes it impossible for them to ever being able to represent any other group. Black people on the other hand aren't , which is why it unacceptable to have a white person represent black people for they are too racist to understand their needs. White people on the other hand should be grateful to have a black person represent them, for as we know white people are just a bunch of cultureless low life shavs, easy to represent and as such its an honour for white people to have some cultural rich ethnic minority stoop so low to represent them. NorthernMonkey, I was simply looking at the "bigger picture", so to speak. Furthermore, if you are such a dedicated fan of Obama, why not accept the Stars & Stripes being flown above City Hall? Don't you see the connection? It's a mark of respect or celebration, regarding your icon. I'm no fan of Obama, but any change of US President has important political implications for our country. Unless of course, you are anti-American, in some way? In future, please spell my second name correctly, by the way. Did we fly the French flag when Sarkozy was elected? Or the Australian flag when Kevin Rudd became PM? I fully support Obama, but we don't need to start flying foreign flags from City Hall. All that should be shown are the British, English and European flags since those are our three identities. NorthernMonkey - is that 'north london monkey' ? If not that what does it matter to you what Boris 'the great' gets up to? I wonder if EU are flags usually flamable? I doubt anyone has ever found out - the EU isn't worth the effort. Well why bother reporting it then? The majority of people reading this site are not Londoners. It sounds as if "NorthernMonkey", might have an "identity crisis"! He is now suggesting that we have three identities. And, all at the same time! Whatever next? I'm also curious regarding his understanding of "foreign"! Furthermore, showing our country's respect and allegiance to America, is not the same as claiming to be American. Our country's "allegiance" to America???! You're not even trying to hide it anymore Julian! This is exactly the problem. We are not the 51st state, we're a separate country. Not sure about the french, but I would say it would be right to fly the Australian flag and others of the commonwealth. Kenneth was still in power when Rudd became PM, and we were more likely to see the red flag flying there than any other. The problem is that talk about Ken Livingstone's "political grave" is wishful thinking. Just because he lost one election does not mean his political career is over. If that were so then our own party would have slunk into the shadows several years ago. Livingstone is still a huge figure in London politics and his conference on Saturday has Lib Dems, Greens, and all sorts of other people at it. That means he is organising and he has a lot of allies. We should recognise that and work out what to do about it, not gloat like little children. Livingstone has had several political careers and they all ended badly. Let us hope this one has as well. He is not getting any younger and he has never done anything outside his own brand of politics. The fact that he still writes columns about the present Mayor and used to go to Mayor's Questions shows that he is a saddo. However, Obama a great man? How does anyone know? He has done nothing apart from winning elections and, by definition, every President has won elections. Obama a great man? How does anyone know? We don't know we have hope. He might be worse than Burning-Bush, lets hope he is not. Bush was ver bad indeed...worse president in my lifetime, I pray that stays true. Now that Boris has started to fly the flag for other countries at City Hall, there is now no excuse for not flying the EU flag, permanently or at least on Europe Day. "As an Englishman, born in New York, as an elected politician, as a democrat and addict of history," should he not also feel cause to celebrate Britain's "unique relationship" with its European partners?! Can't Tories be proud Europeans as well as Englishmen? Perhaps he may listen to "the great man entering the Oval office", whose is likely to favour a Britain with a strong role in the EU. Afterall, what use to him is a Britain detached from Europe and with weak influence in the EU? Stone now believes that the appearance of our leader is more important than his policies.